Finding the exact integrality gap \(\alpha \) for the LP relaxation of the metric Travelling Salesman Problem (TSP) has been an open problem for over thirty years, with little progress made. It is known that \(4/3 \le \alpha \le 3/2\), and a famous conjecture states \(\alpha = 4/3\). For this problem, essentially two “fundamental” classes of instances have been proposed. This fundamental property means that in order to show that the integrality gap is at most \(\rho \) for all instances of metric TSP, it is sufficient to show it only for the instances in the fundamental class. However, despite the importance and the simplicity of such classes, no apparent effort has been deployed for improving the integrality gap bounds for them. 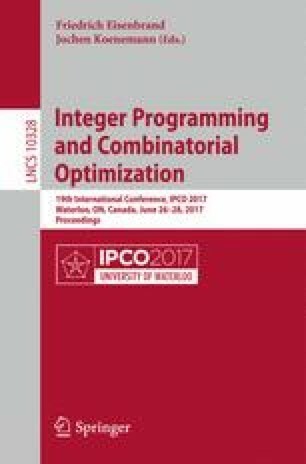 In this paper we take a natural first step in this endeavour, and consider the 1/2-integer points of one such class. We successfully improve the upper bound for the integrality gap from 3/2 to 10/7 for a superclass of these points, as well as prove a lower bound of 4/3 for the superclass. Our methods involve innovative applications of tools from combinatorial optimization which have the potential to be more broadly applied. S. Boyd—Partially supported by the National Sciences and Engineering Research Council of Canada. This work was done during visits in Laboratoire G-SCOP, Grenoble; support from the CNRS and Grenoble-INP is gratefully acknowledged. A. Sebő—Supported by LabEx PERSYVAL-Lab (ANR 11-LABX-0025), équipe-action GALOIS. We are indebted to Michel Goemans for an email from his sailboat with a pointer to Theorem 5; to Alantha Newman, Frans Schalekamp, Kenjiro Takazawa and Anke van Zuylen for helpful discussions.